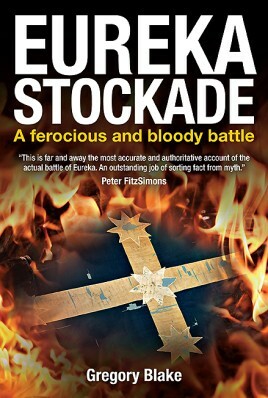 Eureka Stockade: A ferocious and bloody battle, is the epic account of the battle for the Eureka Stockade, an iconic moment in Australian history. On the chilly dawn morning of 3 December 1854 British soldiers and police of the Victorian colonial government attacked and stormed a crudely-built fortification erected by insurgent gold miners at the Eureka lead on the Ballarat Gold Diggings. The fighting was intense, the carnage appalling and the political consequences of the affair profound. This book, for the first time, examines in great detail the actual military events that unfolded during the twenty minutes of deadly fighting at Eureka. Gregory Blake was born in Melbourne in 1955. Since a very early age, he has had a keen interest in military history and has written numerous articles on the subject, for publications in Australian, the UK and the US. Greg is a secondary school teacher and tutor at the Australian Defence Force Academy. Greg served with the Australian Army Reserve during the 1970s and 1980s. He is an accomplished artist and in addition to illustrations in this book, has contributed his talents to magazines and instructional texts both in Australia and overseas.